Sheet size: 15.25" x 11.5"
Fe´lix Bracquemond was born in Paris. He was trained in early youth as a trade lithographer, until Guichard, a pupil of Ingres, took him to his studio. His portrait of his grandmother, painted by him at the age of nineteen, attracted The´ophile Gautier's attention at the Salon. He applied himself to engraving and etching about 1853, and played a leading and brilliant part in the revival of the etcher's art in France. 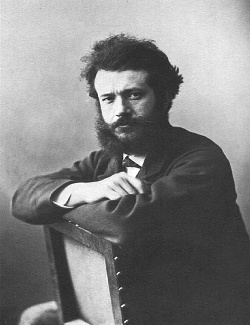 Altogether he produced over eight hundred plates, comprising portraits, landscapes, scenes of contemporary life, and bird-studies, besides numerous interpretations of other artist's paintings, especially those of Jean-Louis-Ernest Meissonier, Gustave Moreau and Jean-Baptiste-Camille Corot. After having been attached to the Se`vres porcelain factory in 1870, he accepted a post as art manager of the Paris atelier of the firm of Haviland of Limoges. He was connected by a link of firm friendship with E´douard Manet, James McNeill Whistler, and all the other fighters in the impressionist cause, and received all the honors that await the successful artist in France, including the grade of Officer of the Legion of Honor in 1889. Bracquemond was a prominent figure in artistic and literary circles in the second half of the 19th century. He was close to writers such as Edmond de Goncourt and critic Gustave Geffroy, and numbered among his friends Millet and Corot, Henri Fantin-Latour, Degas and the Impressionist circle, and Auguste Rodin. He was one of the more prolific printmakers of his time and he was awarded the grande medaille d'honneur at the Universal Exhibition of 1900. He was also a painter, ceramist, and an innovator in decorative arts. Gabriel Weisberg called him the "molder of artistic taste in his time". Indeed, it was he who recognised the beauty of the Hokusai woodcuts used as packing around a shipment of Japanese china, a discovery which helped change the look of late 19th-century art. He married French Impressionist artist Marie Bracquemond in 1869. He died in Se`vres.